This is the best of both worlds, cheesecake and brownies. A lucious cheesecake rests over a rich and chocolate brownie. 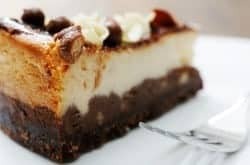 This brownie bottom cheesecake combines the best of the world of brownies and cheesecake. Brownie Melt butter and chocolate in a heavy pan over low heat, stirring constantly, cool. Add sugar and eggs, 1 at a time; mix until blended after each addition. Blend in milk and vanilla. Stir in combined flour and salt, mixing until just blended. Spoon into a greased and floured 9x3-inch springform pan, spreading evenly. Bake 25 minutes at 350 degrees. Cheesecake This is a simple recipe for cheesecake. It will mix up easier if you let your cream cheese soften a bit before you begin to mix it. Beat cream cheese, sugar, and vanilla at medium speed with an electric mixer until well blended. Add eggs, 1 at a time, mixing at low speed after each addition until well blended. Blend in sour cream, and pour over brownie bottom. Bake 55 to 60 minutes or until center is almost set. Cool before removing from the rim of pan. Refrigerate 4 hours or overnight. Let stand 30 minutes at room temperature before serving. I thought the brownie bottom was a bit dry. Thank you for your blunt comment. I am sorry you didn’t enjoy the cheesecake. This comment is very rude. This cheesecake is so good!